Let your best friend know how much you cherish them with this pretty Wish Candle featuring the expression "Best Friends" hand-jeweled on glass. 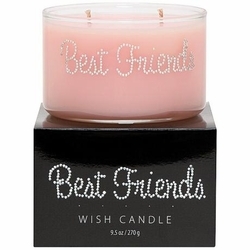 This hand-poured vegetable and soy wax blend comes in a feminine pink that complements its fragrant blend of bright sunny citrus and florals. • Bright sunny citrus with floral scent.